I work on a reward basis only if your item is found, but I have a call out fee of £20 within a 40 mile radius. Beyond this will be discussed. I will search for lost items, be it a ring , jewelry , keys or lost family treasure etc. Or anything that is made of metal wanted or unwanted. I will search in most locations including shallow water, be it your garden, private land or public land. If on private land you will need to gain permission from the landowner or local authority . I am an NCMD member and operate within their code of conduct. I have been metal detecting for about six years now and find it a fascinating hobby and often go out on digs with my local club . So I thought I would put my detectors to good use trying to recover peoples lost items. I am a welder by trade building MRI scanners, and also a keen engineer, so I have an interest in metals from all aspects. I hope my service will reunite you with your cherished lost items. Whilst on a camping holiday near Cirencester, my husbands wedding ring came flying off his finger whilst chucking a rugby ball around on the campsite. After an unsuccessful evening of searching in the grass, I googled how to find a lost ring. Theringfinders.com came up and luckily Constantine was reasonably close by in Oxford. After giving him a call, Constantine was at the site and searching within an hour! 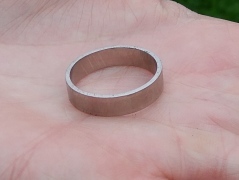 And I’ve very pleased to say my husbands wedding band was found in one hour! We were so happy to see it and are pretty sure we would be driving home with it if it wasn’t for Constantine. Huge thanks Constantine! He is was immediately willing to help and full of confidence that he would find the ring, which he did! Yay! In February 2015 I was feeding the ducks with my young son at my local National Forest Park on a very cold day. As I helped my son to feed the ducks I threw bread and my heat turned over as I heard the distinctive ‘plop’ of my engagement ring fall into the water. I waded in but as I was on my own I couldn’t do much as my son would have been in danger. I was really quite distraught. 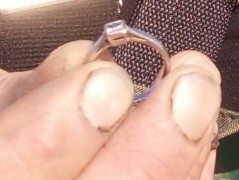 The platinum engagement ring was purchased by my husband 9 years previously. It was of great sentimental value for obvious reasons. It also featured heavily in photos of me holding each of my new-born children photos. I took a photo of where I thought the ring had fallen in the lake. My brilliant husband spent a freezing February morning searching for the ring but he didn’t have the appropriate clothing or equipment. I tracked down a metal detector from the West Midlands who came out to search for the ring twice but it was to no avail. The Insurance Company had by now told me that we weren’t covered by our policy and with 3 young children to care for, we knew we couldn’t afford to replace the ring. We all but gave up hope. Then last week, something prompted me to think of trying again. I found the ring finders website and contacted Constantine. He made it very easy for me and got in touch quickly to organise coming to search. He asked me to let the local park rangers know he was coming which I did and then he arrive on a gorgeously sunny October morning. Constantine told us he would search for around 3 hours. My husband joined him on occasion helping to get rid of some of the weed. My children all came to watch but after a couple of hours went home with their grandparents. The search started at 10.30am. At around 1.20pm (just ten minutes short of the 3 hours! ), my husband and I were sat on a bench feeling sure that the ring must have disappeared for good, perhaps swallowed up by a swan and distributed elsewhere! Then to our utter amazement we saw Constantine hold up something. He was beaming! To our absolute shock, it was my ring, much closer to the edge than I imagined and in immaculate condition. I was totally flabbergasted and emotional. I still can’t really believe that the ring is on my finger and not at the bottom of a lake. I cannot thank Constantine enough for his skill, determination and perseverance. We are delighted that one day I can pass on my ring to my only daughter and simply cannot find the words to express our joy at finding something that is so special to us.